Discussion in 'Contrails and Chemtrails' started by Steve Funk, Sep 22, 2012. This is from Fleming"s 2010 book, "Fixing the Sky, the Checkered History of Weather and Climate Control." On the other side of the coin are conspiracy theorists who see a toxic cloud on every horizon. Their fears are fueled by statements such as those made in 1997 by Secretary of Defense William S. Cohen, who warned of "an eco-typ of terrorism whereby [adversaries] can alter the climate, set off earthquakes, [and] volcanoes remotely through the use of electromagnetic waves . . . . It's real, and that's the reason why we have to intensify our efforts, and that's why this is so important." Cohen, known to levitate on occasion, at least rhetorically, was responding, off the cuff, to questions about the possibility of all sorts of futuristic weopons falling into the hands of terrorists, and his remarks should not be misconstrued. Nevertheless, conspiracy theorists have focused on his words in support of their suspicions that the military is supporting secret geoengineering projects involving directed energy beams, chem trails or other technologies. Fleming's interview was featured in Whywats (after a lot of cut-and-pasting) but he confirmed to me in an email that he does not support the chemtrails conspiracy theory and never has. So I think we can still say that there is not one person with an advanced degree in any form of atmospheric science who believes in chemtrails. The quote from Cohen was from an unpublished department of defense briefing. As far as Fleming, what the heck was he doing in Whywats, did they trick him, did he get paid, is he hard up for attention? Beat you to it by mere seconds, Mick! I didn't ask him why he did the interview. He said they interviewed him about the history (mostly military) of geoengineering, then cut and pasted it to fit their script. His book is a passionate statement on why we should not start with geoengineering. Maybe he thought it would help spread that message. It probably did help sell his book. My local bookstore said their distributor had it on back order. Amazon said four copies left. He posts on various places. Keeps getting miffed that nobody mentions (or uses) his book. He really should go and edit the Wikipedia page on Weather Modification, as it's terrible. If Michael Murphy has used Dr. Fleming's reputation to bolster his claims, then the book's statements can't be simply dismissed without affecting the credibility of the film, or am I being too optimistic here? 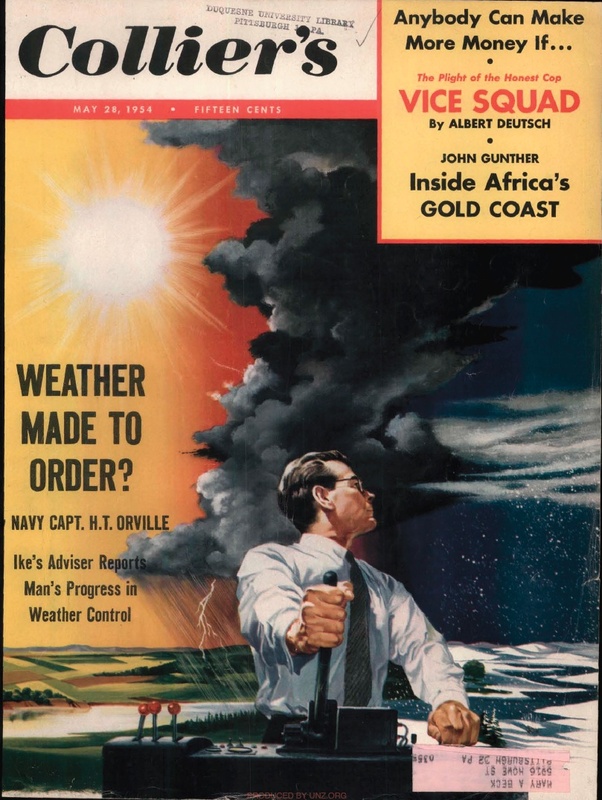 They interviewed me about geoengineering, mostly the military history of this. Then they cut and pasted my remarks into their script. I am definitely not an advocate of the chemtrails conspiracy theory and never have been. Does your appearance in "Why in the World Are they Spraying?" mean that you are now an advocate of the chemtrails conspiracy theory? It would not appear that this is the case based on what you wrote on pages 187 and 264-5 of your book, "Fixing the Sky ... ". If not, do you think that the producers of the film showed your interview accurately, or did they selectively edit it to say what they wanted it to say? I would be grateful if you have time to reply. I am a retired forester in Mount Shasta, CA., and have come to be the main skeptic of this theory in my community. It might be interestng to contact the trader from the Chicago Mercantile exchange. I doubt that he knew what his interview was going to be used for, and probably knows some good reasons why they can't be claiming that billions are being made trading weather. One answer might be that the Weather Derivative market only has a total valuation of just under $12 billion US, according to a 2011 report by the WRMA. I wouldn't be surprised if the chemtrailers conflated total value with profits. Weather Derivatives are basically insurance against loss or reduced profits due to weather related events. The only evidence they could use is if most of the profits and trades are made by a very few entities. It's rather a fruitless avenue to debunk though, as people will only fall for it if they can't really follow it. Ken Caldeiera - Review his Google Tech Talk on climate engineering. He outlines his chemtrail aerosol deployment plan. Yeah, we're all a bunch of weirdos who need to be debunked. All those people have talked about doing climate engineering in the future. You could add thousands of climate scientists to that list. Nobody denies the people have talked about it. There's just no evidence that people are actually doing it. There's a BIG difference between investigating and advocating or doing.